A few years ago, the drink formally known as "perry" was decidedly unfashionable. But the newly dubbed "pear cider" seems to have been the toast of the summer season. How did it happen? For many, this bank holiday represents the last long weekend of summer, a season spent enjoying defining activities like cricket, trips to the seaside and unpredictable weather. And don't forget pear cider. The now ubiquitous pear cider bottle has found its place in British pubs and shops, with 2.5 million consumers reporting they have purchased one in the past year, according to a report from the analysis group AC Nielsen. The numbers tell a bit of a comeback story. Two years ago, Britons spent a modest £3.4m on the cider. In 2008 the number leapt to £46m. The rate of growth is remarkable for a drink that was once practically extinct. Perry was known as a "yokel" drink favoured by people living in farming communities, says Ian Targett, beer and cider buyer for the supermarket chain Tesco. While the company recently released a statement announcing it would adapt to the demand by increasing its own cider range from 11 to 16 lines, perries used to be far less prevalent. "It was seen as the farmer's secret and years ago it was not unheard of for apple growers to keep a corner of a field to grow some perry pears - which they would then make and keep for themselves," he says. 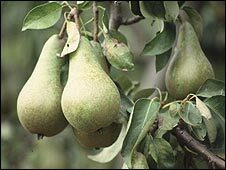 Traditionally, true perry comes only from perry pears, which are smaller and more acidic than other types. The new pear cider is usually made with a slightly sweeter variety, but the two terms are largely used interchangeably. Is this perry or pear cider? And pear cider isn't perry's only alter ego. Branded perries like Babycham, which had its popularity peak in the 1960s and 70s, were sold as cheap, bubbly drinks targeted to women, Mr Targett says. "Ironically its biggest sales have come when it is renamed." But perhaps multiple names have given perry a bit of an identity crisis. When the Brothers Cider company started selling perry at the Glastonbury Festival in 1995, no one knew what, exactly, they were being offered, says Matthew Langley, consumer marketing manager for the company. "We said perry was like cider, but made from pears," he says. "By the end of the festival, it was shortened to pear cider." 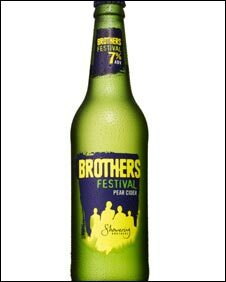 After 10 years at Glastonbury, Brothers launched it products - now officially called cider - to a wider audience in 2005, riding the momentum of a larger cider revival, primarily led by the Magners brand. "Magners hit the roof about four years ago," says Adam Withrington, features editor for the Publican, a newspaper for the pub and bar industry. "When the cider explosion happened, it was about apple." But as the apple craze has settled, pear became a natural extension, he says. "These things go in waves. Pear is the next big exciting thing." The Bulmers, Gaymers and Kopparberg brands have been credited with largely driving the growth in pear's popularity. And the sweeter taste has allowed pear cider to find a niche among younger drinkers. "Younger drinkers' palates aren't particularly used to the taste of alcohol," says Julie Tinson, a senior lecturer in marketing at the University of Stirling in Stirling, Scotland. Rebranding perry as as sweeter version of a pub favourite, like cider, could continue to capture that audience's interest - at least for a while. "Young drinkers tend to be fickle," says Dr Tinson. And that may just mean the big cider companies will have to find a new fruit flavour for next summer.